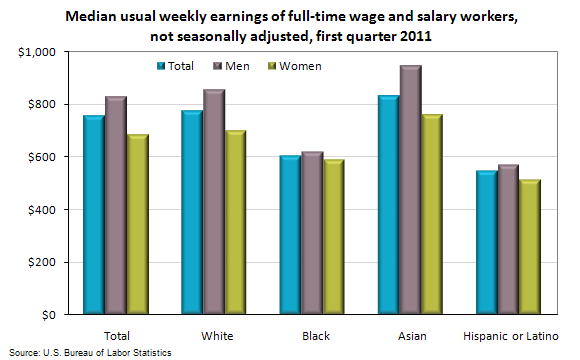 In the first quarter of 2011, on a not seasonally adjusted basis, median weekly earnings were $755. Women who usually worked full time had median earnings of $683 per week, or 82.4 percent of the $829 median for men. The female-to-male earnings ratio varied by race and ethnicity. White women earned 81.7 percent of their male counterparts, compared with black (95.0 percent), Asian (80.4 percent), and Hispanic women (90.4 percent). Among the major race and ethnicity groups, median weekly earnings for black men working at full-time jobs were $621 per week, 72.5 percent of the median for white men ($856). The difference was less among women, as black women's median earnings ($590) were 84.4 percent of those for white women ($699). Overall, median weekly earnings of Hispanics who worked full time ($549) were lower than those of blacks ($604), whites ($774), and Asians ($831). The median weekly earnings of the nation's 98.3 million full-time wage and salary workers ($755 in the first quarter of 2011) were 0.1 percent higher than a year earlier, compared with a gain of 2.1 percent in the Consumer Price Index for All Urban Consumers (CPI-U) over the same period. These data on earnings are produced by the Current Population Survey. To learn more, see "Usual Weekly Earnings of Wage and Salary Workers: First Quarter 2011" (HTML) (PDF), news release USDL 11-0554. Bureau of Labor Statistics, U.S. Department of Labor, The Economics Daily, Median weekly earnings in first quarter 2011 by demographics on the Internet at https://www.bls.gov/opub/ted/2011/ted_20110425.htm (visited April 18, 2019).